Hotties Thermal Packs rider Michael Pearson set a new absolute track record on Sunday on his way to a fairytale Superbike win in the Czech Republic, with Pearson taking the Hotties BMW S100RR Superstock machine to a three second victory, at the Gustav Havel 300 road races in Horice writes Willis Marshall. Pearson’s victory was all the more stunning, after he was taken to Hospital on Sunday morning, after he had crashed while taking in the first warm up for the Supersport 600 race. A trip to hospital was not however enough to stop the former Ballygowan rider from taking part in the Superbike race later in the day, and even in considerable pain, he maintained his 100 % record for having won at the meeting on each visit over the past four years. 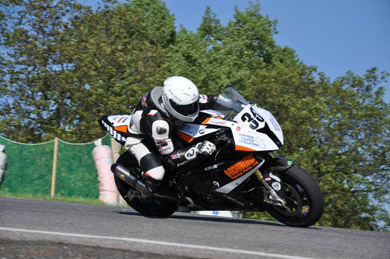 Michael Pearson broke the track record at the Horice Road Races in the Czech Republic. (Photo by Paval Koli). Michael Pearson said: “It’s been an eventful weekend to say the least, but it has all worked our really well and to get the Superbike race win along with the circuit lap record just tops everything. I was happy enough with my practice sessions on Saturday when I was twice piped for pole position in the 600cc and 1000cc sessions. “Race day came and it was a scorching morning and about 9am we went out for the 600cc warm-up run. It was on my second circuit that my world came to an abrupt halt, when the Hotties 600 Suzuki just gave way at the front on the approach to the hairpin bend. I had done nothing different from the previous lap, and I was not even at race speed, so it had to be caused by some debris on the track or something. “It was quit a big get off and hitting a grass bank about 90mph, is not really what I had planned. I was taken to hospital in Hradec Kralove when I was assed, x rayed and scanned, but thankfully I was ok and given permission to start the Superbike race. I was in quite a bit of pain with my shoulder and knee, but I wanted to take part and decided to go for it. “In the race, once I got going, I had made my mind up that I wanted this race win and win it I did with just over three seconds to spare from Kamil Holan. After the race, Willis Marshall informed me that I had set a new absolute track record for the circuit, not once, but three times… I was very shocked but at the same time very pleased.